This book draws us into the dangerous world braved by American and North Vietnamese airmen in the skies over Vietnam. Influential leaders and tacticians are profiled to provide a comparative evaluation of their contrasting skills. 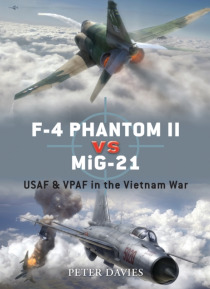 This book also reveals the technical specifications of each jet with an analysis of the weaponry, avionics and survival devices of the F-4 Phantom II as flown by the USA… F and the MiG-21. The fighters' strengths and weaknesses are also compared, including turn radius, performance at altitude, range and structural integrity. First-person extracts reflect on the dangers of these aerial duels, as USAF pilots and their counterparts struggled to overcome each plane's shortcomings.